We wake up to (yes, still) rainy weather and a cold atmosphere. In addition, there is also no hot water in our bathroom, and my dreams of a shower die a shivering death. One of our number is missing as he’s collecting his phone from the police in Siena and the remaining four of us decide to take a self-guided TripAdvisor tour, with yours truly acting as guide. 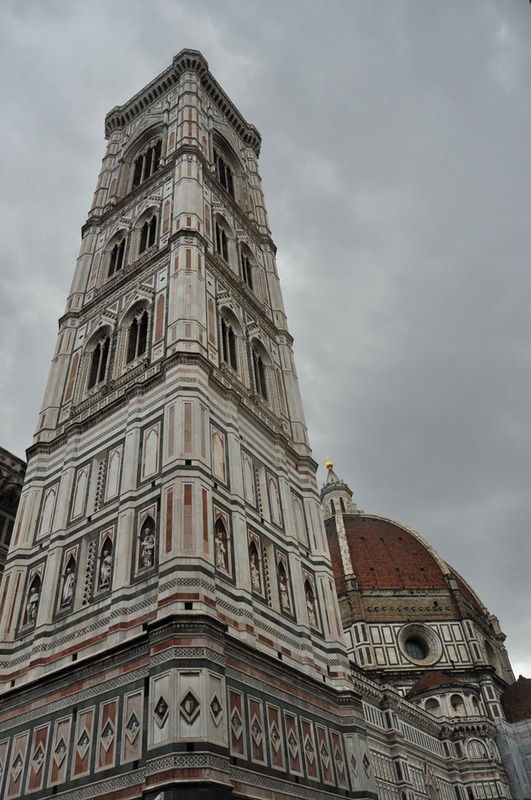 Following the Florence City Guide‘s Historic Highlights Walking tour, our first stop is the Duomo and the Campanile. Both these structures are very impressive and massive, with constructions having started in the 1200’s. 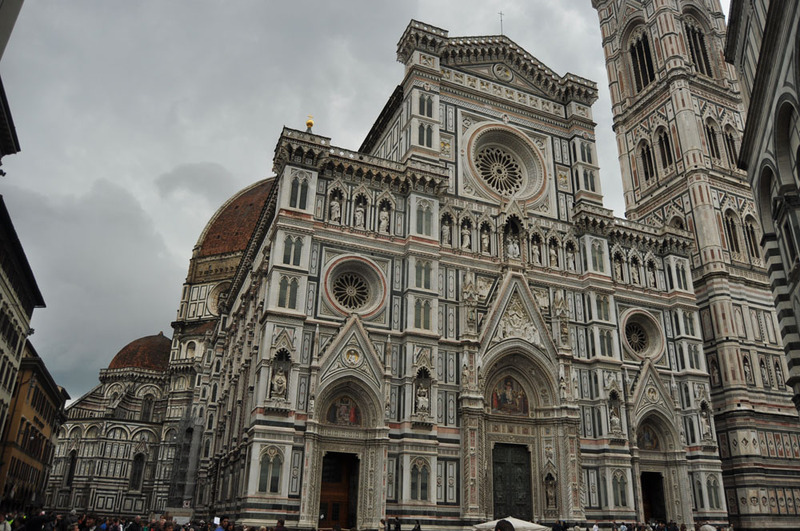 The Duomo cathedral was built with the intent to shame all other churches in the Roman Catholic world – shaming everything that the Greeks and Romans built in their most powerful times, and at the time the design was put on paper, nobody had even known how the dome would be built or supported. Opposite the cathedral is a small baptistry with golden doors depicting scenes from the Old Testament. We continue our “tour”, stopping momentarily in the leather markets and shops to get some gifts for people back home (and because I love the smell of leather). The next point of interest on our itinerary is the Capelle Medicee. These house some of the remains of the Medici family and is home to a lot of their amassed wealth and some interesting relics. The Medicis produced four Popes and financed a lot of the Renaissance in Italy, with staggering amounts of work being commissioned by the artists in the area. We receive an sms from our somewhat lost friend that his train is not too far from Florence, so we start heading towards the Santa Maria Novella train station. 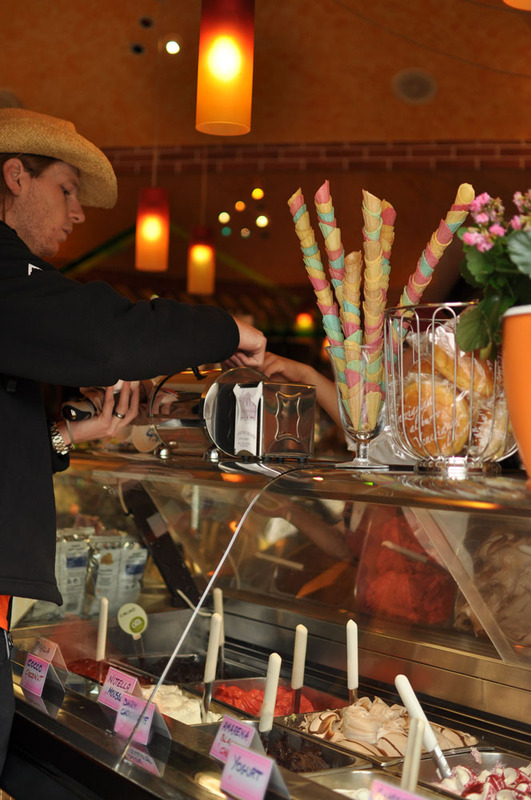 We find a gelato store on the piazza in front of the Santa Maria Novella basilica, and decide that this is a great meeting spot. 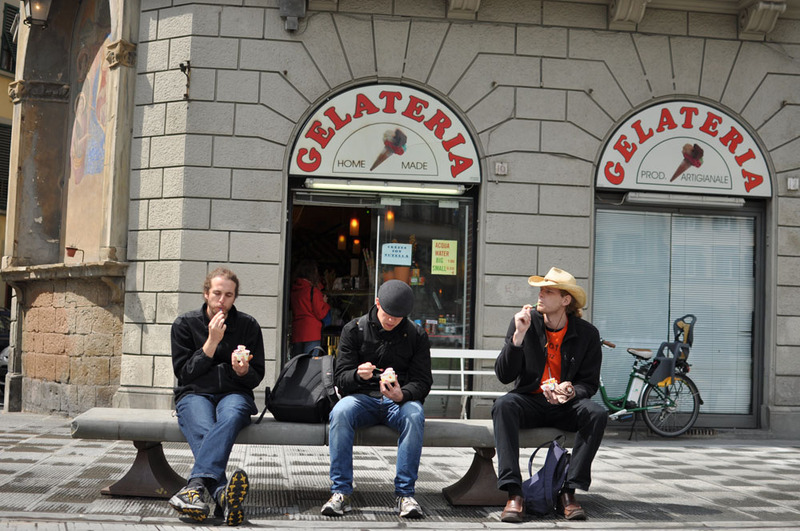 The sun also shows up for a few minutes and we lavish in the sheer awesomeness of sunshine, eating gelato on a random bench in Italy. Finally reunited, we forget about following our tour and head towards some shops and other things that catch our fancy. We end up in the Piazza della Signoria and view the copy of Michelangelo’s David, together with an assortment of other amazing sculptures that are on display. Musicians play in the space outside and we find a few steps on which to sit down for a while outside the mull of the crowd. It’s a Sunday in Italy and the locals seem to take to the streets as badly as the tourists, taking advantage of the little sunshine there is. From here we head across the river to view the Ponte Vecchio and visit either the Boboli Gardens or the Parco Bardini (I can’t remember which). It offers a nice view of the city and the gardens are immaculately kept. It starts raining again while we are here though, so we head back to our lodgings to have some dinner and prepare for per-birthday celebration night out for me. We end up finishing four bottles of dreadful red wine and take to the streets of Florence in search of a party. We meet up with some locals who are also enjoying a Sunday night on the town, and we return home at some unholy hour the next morning. Our plan for today is to visit the Uffizi gallery before parting ways. Francois and I head further North into Italy tomorrow, while the other three are sleeping in Venice tonight. To our dismay, the Uffizi is closed on Mondays and only Francois and I will be able to visit it tomorrow. Instead we head up the hill towards the Piazza Michelangelo to collect the rental car and return it. The view from the piazza is amazing! After returning the car, Francois and I are alone for the afternoon and we stroll through the shops and markets once more. Both my mom and mother in law gave me some money for my birthday and I’m in search of a gift for myself from Italy. I find a gorgeous brown leather jacket and red gloves (lined with rabbit fur) and from here we head up to check into our hostel with a room for two instead of five. We’ve also procured some more stock for our depleted grocery bags and have coffee in a quaint little shop across the street. We have dinner on our bed and find this is the first time since our arrival in Europe where the WiFi access actually works relatively well in our rooms. I chat with my mom in SA (who is very happy to find out we’re OK and enjoying it) and share some of the places we marked off as interesting in Venice with the guys there. We’re in bed fairly early and sleep rather well, considering that there is an entire school booked into the same floor as ours. Francois and I booked our tickets for the Uffizi gallery online and, after collecting our (much smaller) new rental car, we arrive early and miss most of the first crowds in the gallery. We buy a guidebook in the foyer and start strolling through the artworks, starting in Medieval and Byzantine eras, moving into the Renaissance and a little beyond. Sadly no photos are allowed, but it helps to not distract one from the art. The highlight of the visit for me is Sandro Botticelli’s The Birth of Venus, and I spend a good amount of time staring at the immense work. 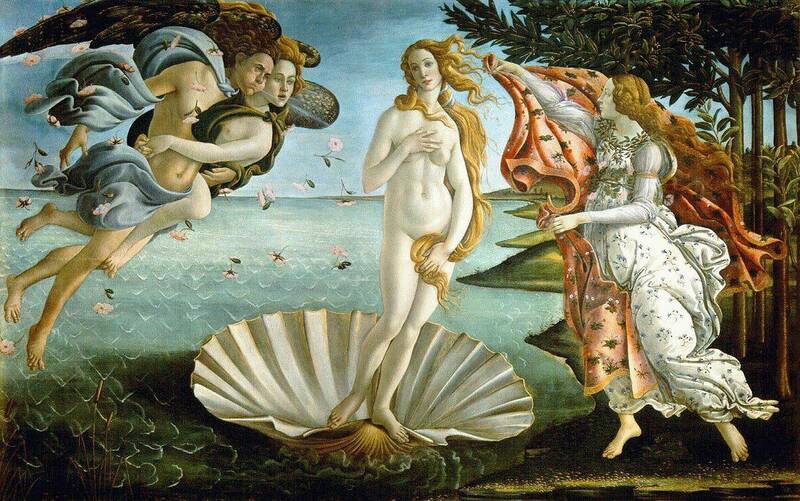 Sandro Botticelli’s The Birth of Venus, c. 1486. Tempera on Canvas. Uffizi Gallery, Florence. (From sinoorigin). Our tired feet let us down sooner than we were hoping on and we head back to the car and start our drive North. We are sleeping in Genoa tonight, and we’re taking a route that will lead us along the western coast of Italy. Continues in part 6 with our drive up the coast to Genoa and Turin, Italy. 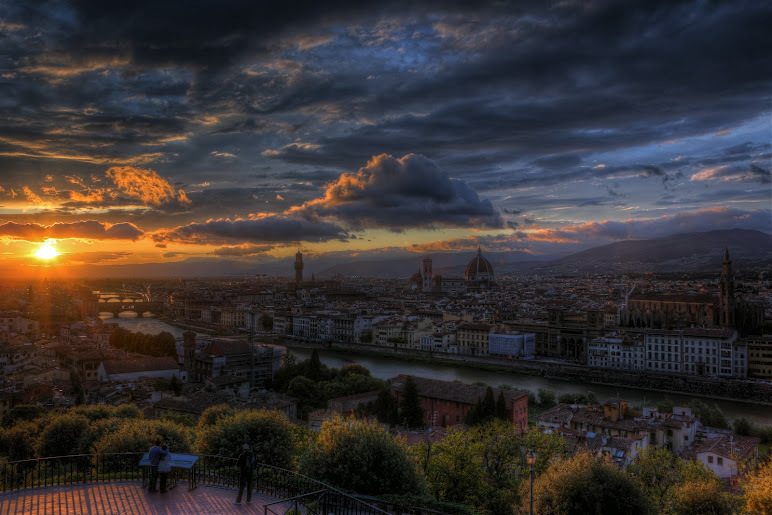 Florence Sunset #1 by Christian Krieglsteiner. The Birth of Venus by sinoorigin.